SMILE and say HELLO to your new travel companion, your Personal Photographer! CLIOK brings to you Modern, Sleek, Compact, & the most beautifully designed Bluetooth SELFIE STICKS on AMAZON! • No more asking strangers to click photographs. • Get the best photo in a single shot just as YOU want it. • Get those WIDE angled slicks with EVERYONE in it. • Stay PREMIUM & NEAT with the non slip HIGH QUALITY rubberized Selfie Stick & NO WIRES. Why buy a PREMIUM CLIOK product? • We bring you the best of technology with Bluetooth 4.0 for ease of operation. • Unlike others, our products are DESIGNED IN LONDON. • We maintain the highest quality standards. Your phone remains safe without slipping. • We provide you with a 12 month 100% MONEY BACK GUARANTEE. So GO AHEAD…it’s time to MAKE MEMORIES with awesome photographs! Call me crazy but why do the instructions differ between iOS and Android? Drives me nuts! These are Selfie Sticks, for crying out loud! In the simplest terms, go to your app screen and click Settings or the gear icon. Find the volume key or the icon you use to take pictures. This key will allow you to take your pictures or zoom. What is the SMART feauture and how does it work? • The Selfie Stick comes with a SMART auto-sleep function. • If it is switched on and it doesn’t get any input from the user for a couple of minutes (4-5), it will automatically switch off and go to sleep to save the battery. • If it was connected to a device before it went to sleep, then it will connect automatically to the same device on wake up. • Wake up is seamless: Just (short) press the shutter button and it will connect as long as the Bluetooth on the device connected to previously hasn’t been turned off or restarted. • This allows you to save the battery and enjoy the Selfie Stick for longer periods of time. ★ The ONLY SMART Bluetooth Selfie Stick on AMAZON: Super fast connectivity and sleeps automatically when not in use. 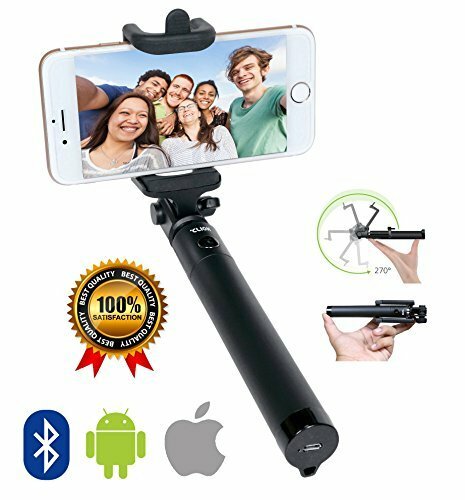 It AUTO-CONNECTS seamlessly with a single press of a button, which is not available in other Selfie Sticks. ★ Don’t settle for cheap quality imitations. We invest more to bring you the BEST QUALITY and BEST FEATURES at the BEST PRICE. ★ SUPER EASY TO USE: Simple, Intuitive plug and play function. Easily pairs with your smartphone for GREAT PHOTOS. Rubberized handle, Silicon spring loaded clamp, Screw lock mechanism, and Wrist band. Loaded with features to ensure your phone stays safe in place. ★ COMPATIBILITY: Compatible with iOS | Android (Samsung, LG, HTC, etc)., iPhone 6, and iPhone 6 Plus. ★ 100% SATISFACTION: We spend extra time and effort on the product to make sure we will not be beaten on quality. We are so confident you will love the product that we give you a 100% MONEY BACK Guarantee.